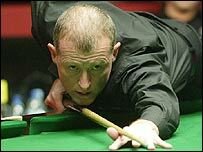 Steve Davis made a stunning comeback to knock title-holder Stephen Maguire out of the UK Championship in York. Davis, 48, took five of the last six frames, including the penultimate with a 145 break to win 9-8 and book a quarter-final meeting with Ken Doherty. Earlier, Stephen Hendry was also in vintage form as he beat Mark Williams 9-3 to set up a tie with Ali Carter. In the evening session, Neil Robertson beat Shaun Murphy 9-8 while Joe Perry overcame Mark King 9-6. Davis put in a fine performance to power his way into the last eight. Maguire led 5-3 overnight and at 7-4 looked poised to wrap it up but the six-times former world champion refused to buckle and worked his way back into contention with some typically inspired safety play. At 8-7 down the 'Nugget' knocked in his 145 - his highest since his ground-breaking maximum in 1982. In the final frame, after Maguire had missed a presentable opening red, a run of 78 proving enough to dethrone the Scot. "That was the best match I've been involved in for ages, if not ever in some respects," said the world number 15. "Some people would say it was my best performance since the 80s and it may have been my best ever. "I knew I would play well, I just didn't know if I could compete to Stephen's standard. "I just went out and played, put my brain in neutral and mugged him on the line." Hendry's win enabled him to regain the provisional world number one spot after an eight-year gap. The Scot showed no mercy to his close friend Williams, who was the game's dominant player three years ago but is struggling to retain his place among the elite top 16 for next season. Hendry, leading 6-2 overnight, took the first frame of the afternoon to extend his advantage before Williams hit back in the next. But the four-time champion took the next two frames to ease into the quarter-finals. "You don't expect to win 9-3 against someone as good as Mark Williams," said the six times former winner of this title, the last occasion being in 1996. "But Mark isn't playing as well as he can and isn't as confident as he was. The long pots he usually produces aren't there at the moment. "I played pretty solidly and had good 'run'. There were a couple of really big flukes that let me in to win frames." Hendry and Doherty are the only two of the top 12 seeds to remain in the tournament after world champion Murphy lost a deciding frame against Australian rising star Robertson. Murphy was 6-4 down before recovering to win three consecutive frames, but Robertson battled back by compiling a break of 47 which carried him over the winning line. Robertson said: "I'm thrilled to get through, that's the best I've played in a televised match. "Shaun has a bit of an aura around him now he is world champion and was very confident. "But I had beaten him a couple of times before and I can definitely win this tournament." King, conqueror of Ronnie O'Sullivan in the previous round, held a 6-2 lead over a badly out-of-sorts Perry after their opening session. But the Romford player failed to win another frame when the match resumed, and Perry reeled off seven in succession to secure a meeting with in-form Stuart Bingham.